Just in time for swim season and sun-splashed days in your backyard pool resort, here is a great rundown of popular swimming pool games. So that everyone can join in the fun, we have included swimming pool games for kids of all ages—including the adult ones. And all of these activities can be played with heads above the water, so holding your breath or underwater swimming is not needed. Take the game of tag up a level: One or more players has the role of the shark; everyone else is a dolphin. The shark takes up position in the middle of the pool. The dolphins try to make their way past the shark—who cannot move until he/she calls out “shark attack!” At this point, the shark tries to prevent the dolphins from making it across the pool length and reaching the safe zone. One variation: any “tagged” dolphin immediately becomes a shark and can attack the remaining dolphins. Teams of two battle the competition by having one teammate—usually the shorter, smaller one—sit on their teammate’s shoulders. The object is to knock the other team’s sitting player off their perch and into the pool water. You can use inflatable bobber or pool noodles as well. Keep things friendly and note that this game is better suited for adults and responsible teenagers. Get your game on. Put up a special pool volleyball net across the pool in the shallow end or middle area of your pool. Divide into two teams, and have at it with a regular or water-proof volley ball. Serve, set, spike! It is basketball or Horse—but you can play in a cooler environment, a swimming pool! 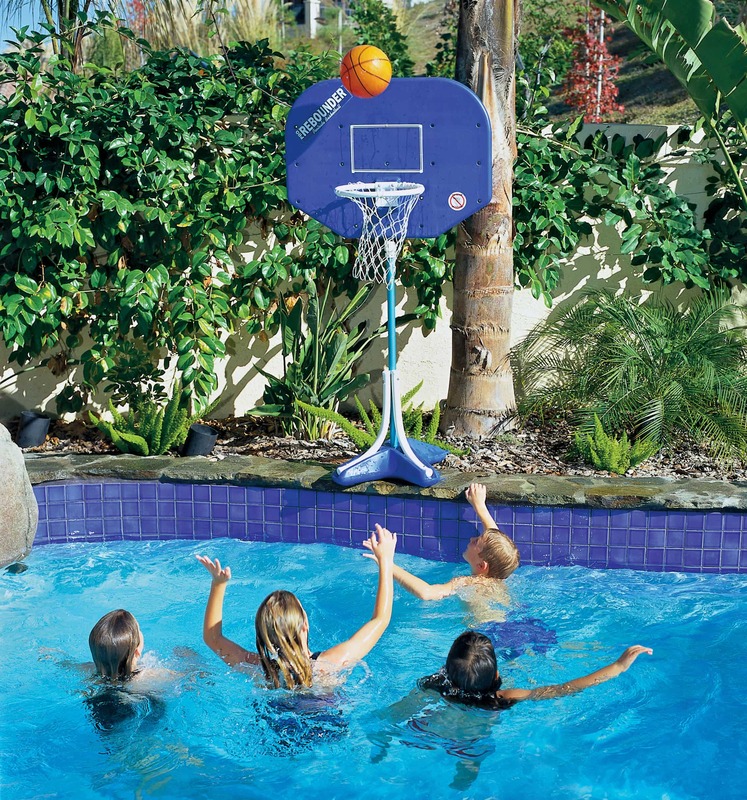 A wide array of temporary and permanent poolside basketball hoops and backboard sets are available online and in stores; some provide adjustable heights that can be changed to suit the height of child or adult players. Shoot, dunk, dive, and dip. Don’t have four players interested in a game of chicken? Jousting represents a similar aquatic “battle,” but needs only two players. Using an inflatable jousting set with a set of “logs” and boppers. Each player needs to maintain their balance on their log while maneuvering to knock the opposing player off theirs and into the water. Safety means adults should not be intoxicated in the pool, and when children are in around and in the water, responsible adult supervisions at all times is recommended.